This week's theme is: KING SIZE! You can tell she had fun FMQ a variety of patterns in all those colorful bands. Congrats on this wonderful KING size finish Janine. Be sure to stop by her post by clicking right here. I don't do King, but look forward to seeing what others do. I hope you don't mind that I shared 3 king size quilts. I have a king size bed so I have to make quilts for it don't I? Wow, that is one big quilt. Nothing that big from me, queen is the largest I've ever done. I've only made one king size quilt, and it was before I began blogging. I was thrilled that it won an honorable mention in the local guild show. 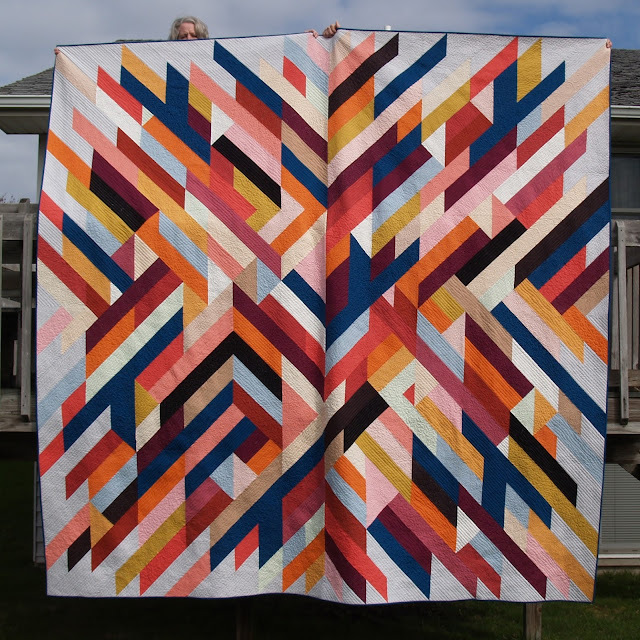 Wow--that is one huge quilt! I have a king size bed, but most of the quilts I have made for it are still just tops! That is a WOW quilt! Great visual impact, and of course I love all the quilty texture! I've made one over-sized king that finished at a ridiculous 120" square - custom made to fit my brother's 70's bed frame. It was my second quilt. Crazy!